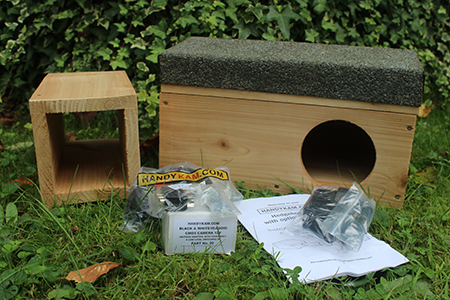 If you don’t want to make your own hog box then the Gardenature Hedgehog Box offers an excellent quality ‘Ready made’ option. Providing a snug home for hedgehogs in your garden is one of the best things you can do to help our prickly garden visitors. You can make your own by recycling some garden materials but if you don’t have time or aren’t feeling that creative there are a number of ready made hedgehog boxes available. 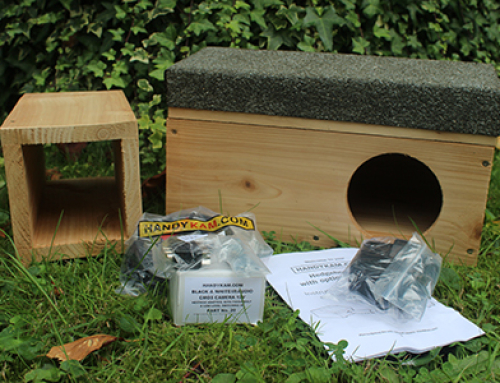 Gardenature offer a a box specially designed for hedgehogs and they’ve kindly sent me one to have a closer look at. 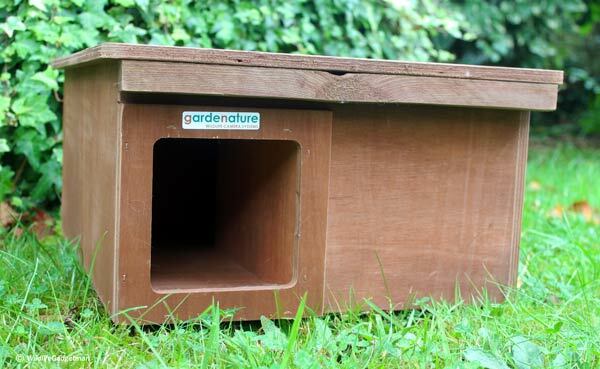 The hedgehog box is made of 12mm thick exterior resin bonded ply (from a renewable source) and is coated with a ‘wildlife friendly’ stain on the outside only to add a little extra protection to the timber. 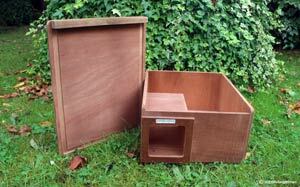 As with bird boxes you should always avoid boxes that have been stained or painted on the inside. The box panels look like they have been either laser cut or cut out on a CNC machine. 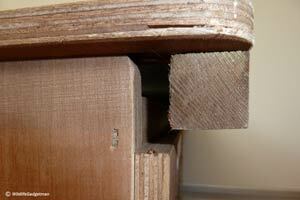 This gives you very clean edges and this helps to ensure all joints are gap free, ideal to prevent chilly drafts etc. It is difficult to tell whether the joints are glued as the joints are so tight but they are definitely held together tightly using galvanized staples. The detachable roof has no fittings to securely attach it to the body of the box but it does have a channel which allows for perfect alignment on the box. It might be worth adding a couple of bricks on top when you finally position the hog box in the garden to make it a little harder for any potential predators to lift the roof. The box is supplied with a fixed internal tunnel arrangement and the tunnel entrance is reinforced using an extra thickness of 12mm ply. 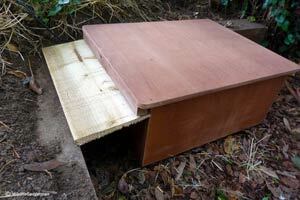 Looking at the underside of the hog box you’ll find a couple of chunky runners securely attached. This helps lift the box slightly avoiding direct contact with the damp cold ground and also allows a little bit of air flow under the box to help with ventilation and limit the potential of damp. 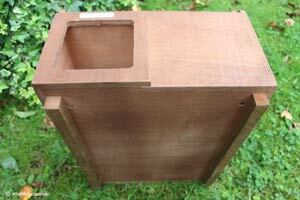 A crucial element of any hedgehog home is to ensure there is adequate ventilation inside the box. 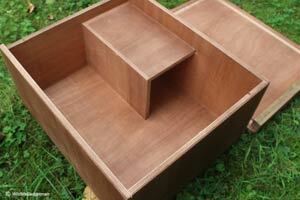 This box uses a simple gap along the top of the front panel and is protected by a chunky baton fixed to the roof. This is handy because it also makes it easy to ensure the roof is placed on the box the right way round. The internal entrance and tunnel make for a good compact design. This will likely give you slightly more options when looking for the ideal location to position the box in your garden and you won’t need so much material to cover the box either . 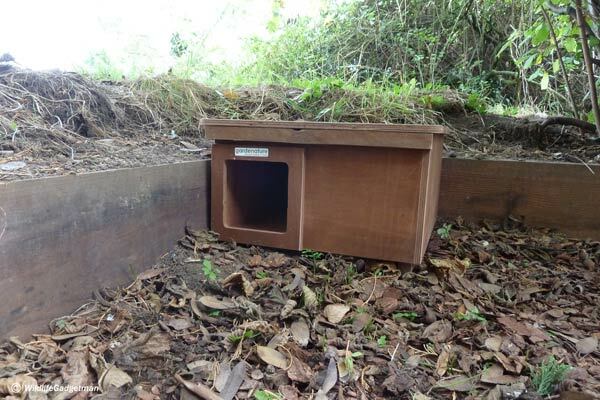 At 120mm square and 270mm long, the entrance tunnel will accommodate even the largest hedgehog whilst helping to deter cats and potential predators. However, I’ve seen cats squeeze into impossibly small openings like this so although it won’t totally eliminate entry to an inquisitive cat it will hopefully reduce it. The internal dimensions of the box is important too. Too big and the box will be too drafty and the hedgehog may burn more valuable energy than required looking for extra bedding material. 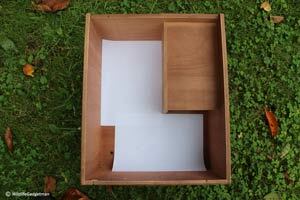 Too small and it becomes unlikely that the box may be chosen by a female as a place to give birth. I always use the rule of thumb of having a floor area no larger than an A3 sheet of paper and no more than 150mm high. In my opinion, this box is the perfect size. 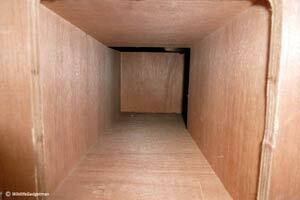 The compact design (internal tunnel) gives you a few more options when looking for a suitable position in the garden. The box comes with a sheet of simple instructions offering advice on choosing a suitable location. As the hedgehog box is made from exterior resin bonded ply and coated in a water resistant layer of stain it should be pretty hardy. I always like to add an extra layer of protection though. I save my bird food sacks for this purpose. Another handy bit of recycling! It’s then a matter of covering the box with a generous layer of brash and leaves etc. 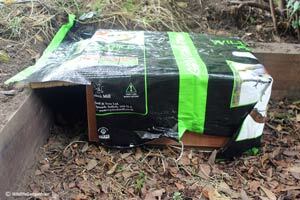 And here’s the finished hedgehog home! 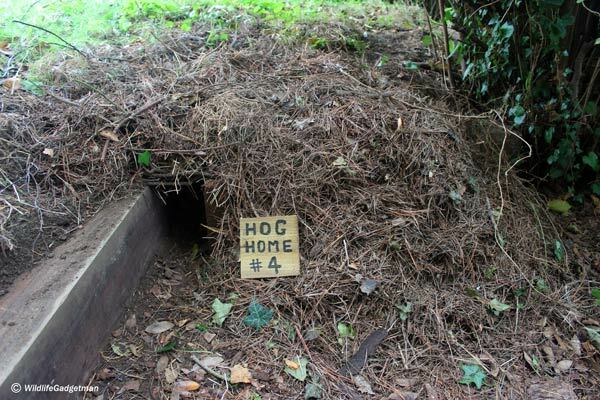 A cozy hog retreat if ever I saw one. If you are a rescue centre or a ‘hog nanny’ for one you may make it a little easier to access the box if you have to by covering it in a slightly different way but for 99% of us who just want to provide a warm cozy place to sleep and overwinter then this is ideal.